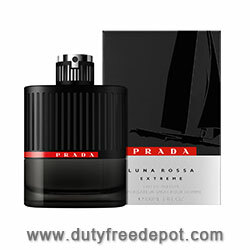 Spicy, dark and intensely sensual, Prada Luna Rossa for men draws its inspiration from the adventure and strength involved in sailing. It takes sport to the maximum, crashing through barriers with intense facets that are as mysterious as the depths of the ocean. The fragrance opens with a spicy fresh accord of Italian Bergamot and black pepper, before a heart of leathery balsamic labdanum and juniper berries create intrigue. In the base, hypnotic lavender absolute and vanilla build up to an addictive, aromatic crescendo.